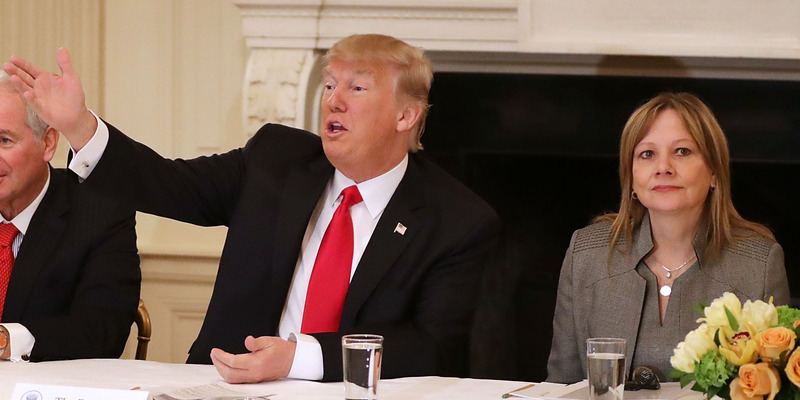 Chip Somodevilla/Getty ImagesPresident Donald Trump and GM CEO Mary Barra. President Donald Trump attacked General Motors over the automaker’s announced shake-up. GM will stop producing cars at the plants in Ohio, Michigan, and Ontario, Canada. “They better damn well open a new plant there very quickly,” Trump said, referring to the Ohio plant. President Donald Trump shot back at General Motors on Monday after the automaker announced it would stop producing cars at three North American plants – two in the US – and lay off 15% of its salaried workforce. Trump told The Wall Street Journal that the automaker should stop making cars in China and open a new plant in Ohio instead. The GM plant in Lordstown, Ohio, is one of the three factories that will no longer produce cars under the company’s new plan. “They better damn well open a new plant there very quickly,” Trump told the Journal. The president said he spoke with GM CEO Mary Barra on Sunday night about the cuts and offered a warning to the executive. “I love Ohio. I told them, ‘You’re playing around with the wrong person,'” he said. Trump was not the first politician to attack GM’s decision:Ohio lawmakers from both sides of the aisle blasted the announcement. In addition to the Ohio changes, GM will also cease production at plants in Michigan and Ontario, Canada. The company did not announce the exact fate of the workers at those plants, as the automaker must still negotiate a deal with the auto unions. In total, the three plants employ around 6,700 workers. GM said the factory changes and workforce reductions were part of a long-term restructuring effort and declining demand for sedans. According to the company, the changes will save $US4.5 billion by the end of 2020. As Trump was departing the White House for Mississippi, the president also suggested to reporters that Barra could replace the Ohio factory’s current production of the low-selling Chevrolet Cruze with other work.